Halloween brings with it the feeling of festivities. Talking about Halloween, how can we forget about the tradition of trick and treat. Just to immerse completely in the feeling of Halloween, we at ProofHub have got a big treat waiting for you! Introducing – File sharing in Chat! Now you can share attachments such as Documents, Images, Videos and GIFs in chat to make communication more clear and effective! You can share all kinds of files in any format, such as PDF, DOC Files, Spreadsheets, GIFs, Images, Videos and more. 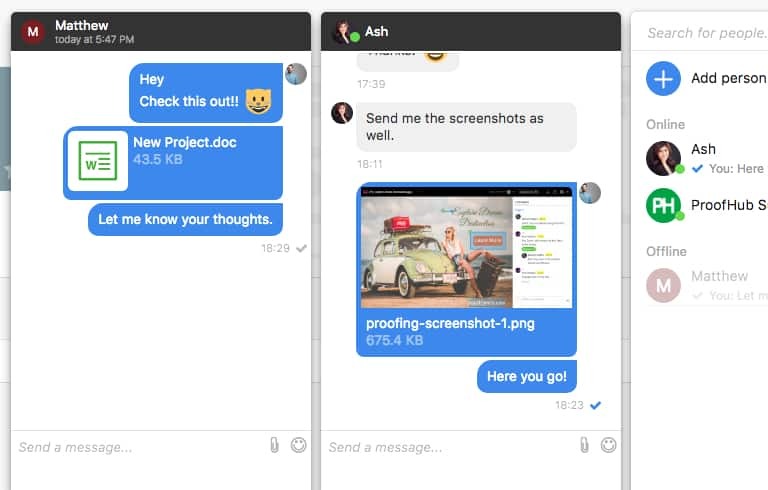 ProofHub chat lets you share files of any size. Whether it is a large PDF document or a small JPEG image, you can share them instantly without any trouble. Whether you share the file on the mobile or desktop, it will be automatically synced and visible across both the platforms. You can even send more than one files in one go. So, there is no need to pick a single file and waste time. Simply select all and share! Make communication quick, clear and effective with these enhancements. If you haven’t checked it out yet, give it a try now. We are sure you’re going to love it!